IPAKITINE powder is a food supplement formulated for use by cats and dogs suffering from kidney failure. When the kidneys are damaged or failing, they cannot excrete phosphorus through the urine as a healthy animal would. This means that it can build up in the bloodstream, and because it binds with calcium it can cause calcium deposits to form in blood vessels and organs. The ingredients in Ipakitine act as phosphate binding agents and lower the absorption of phosphates from the intestines so it is lost in the faeces rather than staying in the bloodstream. The binding action also causes a reduction in the absorption of some uraemic toxins that can affect normal kidney function. 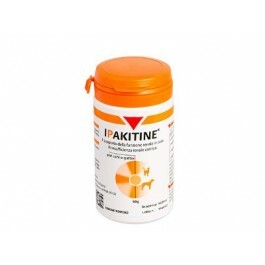 Through this double action, Ipakitine supports normal kidney function. Ipakitine should only be used under direction from your veterinary surgeon after kidney disease has been diagnosed. Chitosan derived from chitin, by a process of de-acetylation. Chitin is a natural substance, the main building material of exoskeletons of arthropods. Due to chitosan's specific molecular properties, it acts as an absorbent in the intestines and thus lowers the absorption of certain substances that can be harmful to the kidneys, including phosphates and some uraemic toxins. Give 1g / 5kg body weight twice daily, mixed with food, for up to 6 months initially. One level scoop measures 1g of powder. It is recommended that a check up is performed every 6 months. Always allow free access to fresh water during administration. More information about Ipakitine and kidney disease can befound here.